On a chilly Sunday morning in late November 2010, Susan Freis Falknor of Friends of Bluemont joined Todd Peal and me, to search for artifacts at Bluemont's Snickersville Academy. I am a father of two and a local government employee. Todd is a metal fabricator by trade, who is married with a son attending Old Dominion University. 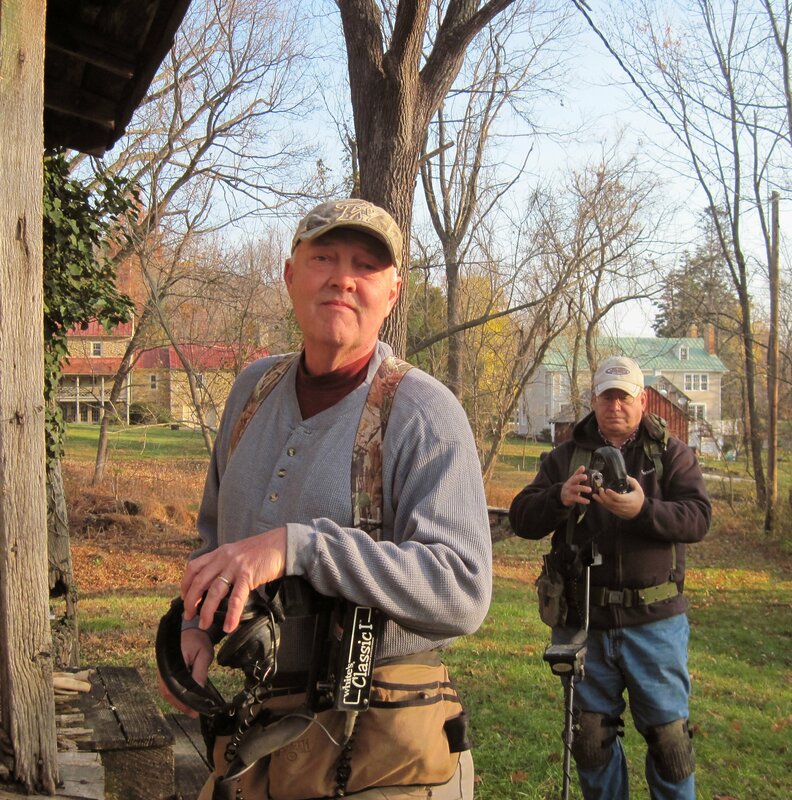 We both have a keen interest in local civil war history and are both from Fairfax. 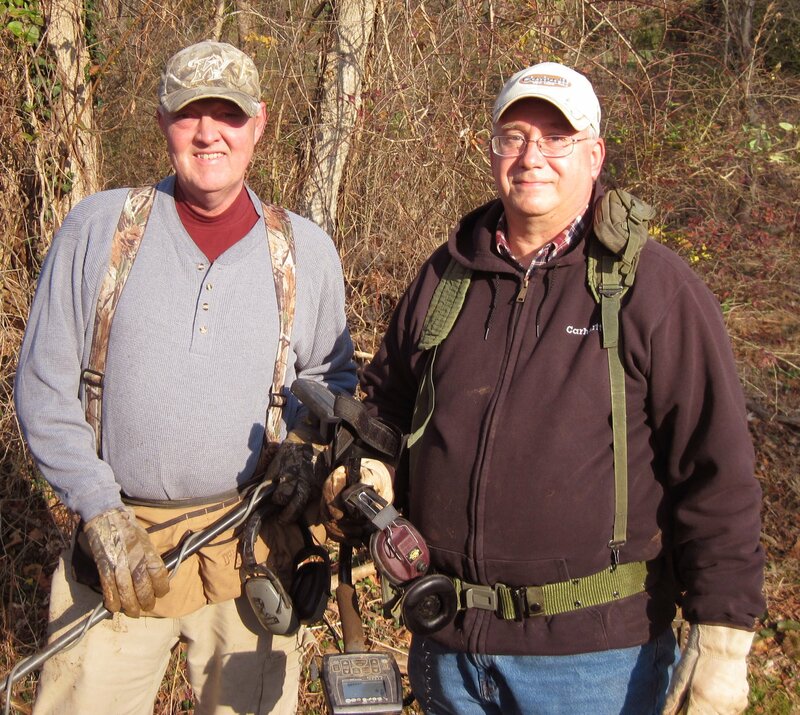 In fact, just about every weekend, weather permitting -- although not during the deer hunting season -- Todd and I devote 4-8 hours a weekend searching for artifacts from the colonial or Civil War eras using metal detectors. Over the years, we have conducted many artifact hunts throughout the region. However, this hunt was our first in the Bluemont area. Our mood before the hunt was optimistic, as we spotted a full grown bald eagle, an omen of good luck, on our drive to Bluemont. On the artifact hunt at the Snickersville Academy, the metal detectors beeped constantly as we surveyed the grounds of the academy. This was Susan's first time out, so we coached her in the finer points of scanning, listening for the "beeps," digging, and then carefully replacing the disturbed turf. 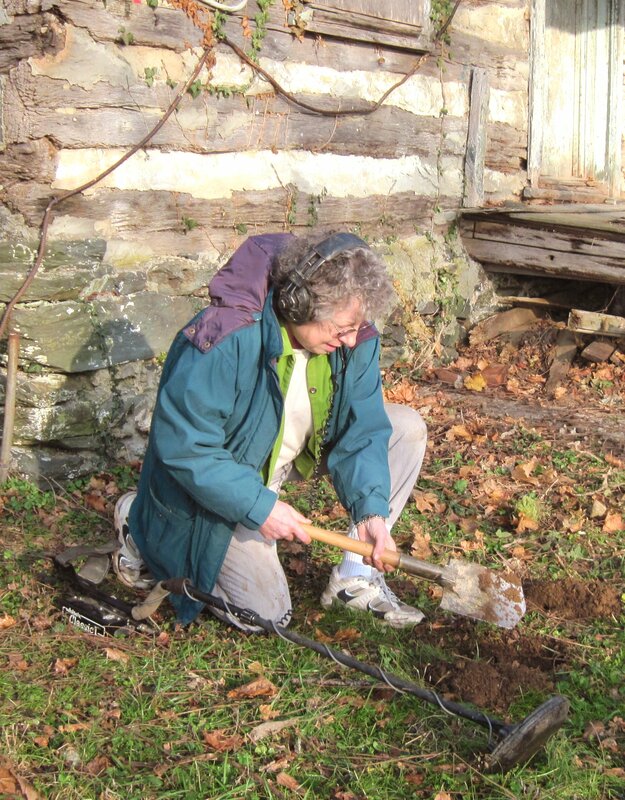 After 185 years of occupancy as a school, church and residence, and use as an area for hunting and trapping, hundreds of different metal items had been dropped on the ground surrounding the 1825 log cabin and subsequently buried. As we swept our detectors over the ground, they picked up several different targets with each pass. Nails (both modern and antique), screws, bolts, buttons, grates, bottle lids, bottle caps, soda and beer cans, pull off disposal lids from modern cans, legs of a cook stove, iron leg trap, balls of aluminum foil, brass hinges, door knobs, galvanized metal objects, lighters, vehicle parts, numerous unidentified metal objects and approximately a dozen coins, etc. It is interesting to note that the acidic soil at this site had all but removed the silver coating from the few quarters and dimes found in front of the cabin. 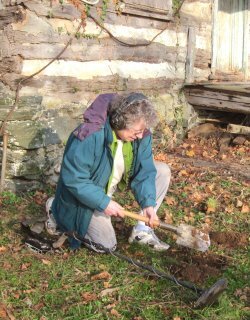 While no major colonial or Civil War era artifacts turned up during this outing, both the old hands and the beginner, Susan, enjoyed the adventure of finding long-buried objects. That is the thrill of artifact hunting. This time we found almost all modern items. On other hunts, we have often unearthed historical artifacts as well as modern items. Would you like to survey your yards, fields, or pastures for artifacts? In an old area like this, you never know what you might find. Contact me at Jbakos1@AOL.com or Todd at T5362@cox.net. We would very much like to do more searching in the Bluemont area.